WEDNESDAY, Feb. 20, 2019 (American Heart Association News) — Despite medical advances, having diabetes is still linked to a higher risk of dying from cardiovascular disease, new research shows. It’s long been known that diabetes — a condition that causes blood sugar to rise — increases the risk of death from multiple causes. Past research showed people with diabetes are twice as likely to develop and die from cardiovascular diseases, including heart disease, heart failure, heart attack and stroke. But there has been little research looking into diabetes-related mortality among patients getting routine care in the modern era of reducing cardiovascular disease risk. For the new study, published Tuesday in the Journal of the American Heart Association, researchers from several Veterans Affairs hospitals looked at data from more than 960,000 people — including nearly 330,000 with diabetes — who received routine primary care from 2002-2014 in the VA Healthcare System. After analyzing an average eight years’ worth of data for each patient, researchers concluded that while diabetes-related deaths were lower than they were in the 1980s and 1990s, diabetes still had a major impact on higher death rates. The study found diabetes was associated with a 16 percent increase in dying from any cause and an 18 percent increase in dying from cardiovascular disease. 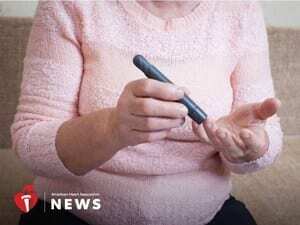 The study also showed that for people who had diabetes, an A1C level of 6 percent to 6.9 percent was associated with the lowest levels of death, regardless of how old they were. An A1C test measures a person’s average blood glucose control for the past two to three months. “I think that’s notable, because it shows age alone isn’t that informative. Treatment decisions are a lot more complicated than just basing decisions on someone’s age,” said Dr. Sridharan Raghavan, the study’s lead author. Raghavan, a professor at the University of Colorado School of Medicine, said that while the exact relationship between A1C levels and mortality rates — and how to use A1C measurements to guide care — remains unclear, doctors should watch the levels closely in patients with diabetes. “Even if we don’t understand the relationship, it can still tell us something about a person’s overall health and risk of mortality,” he said. Dr. David Aguilar, a cardiologist who wasn’t involved in the study, said the research was limited by being an observational study of mostly male military veterans. But he said the results added to the body of evidence for treating diabetes to lower mortality risk. “It shows that we’re doing better, but it also reminds us of the importance of glucose control. We need to treat people according to guidelines and get their hemoglobin A1C levels to less than 7 percent if they can tolerate that safely,” said Aguilar, an associate professor of cardiovascular medicine at the McGovern Medical School at the University of Texas Health Science Center at Houston. Aguilar, who wrote an editorial that accompanied the study, called for future studies that explore the best strategies to lower cardiovascular risk with newer diabetes medications. Raghavan said more research is needed to pinpoint which patients are best able to lower their mortality risk by maintaining specific A1C levels. Both agreed that education is key to dropping the risk even further. Aguilar pointed to “Know Diabetes by Heart,” a new initiative launched by the American Diabetes Association and American Heart Association to raise awareness about the link between the two diseases. According to a recent Harris Poll, only about half of people 45 and older with Type 2 diabetes recognized their risk for a heart attack or stroke. About 26 million American adults have been diagnosed with diabetes, and an additional 92 million have prediabetes, a condition that increases the risk for Type 2 diabetes. “You can actually mitigate a lot of the mortality risk related to diabetes by controlling cardiovascular risk factors like smoking and cholesterol levels and blood pressure levels,” Raghavan said. Aguilar said doctors need to have frank discussions with patients about the relationship between diabetes and cardiovascular disease, and talk about how exercise and maintaining a healthy weight decreases heart disease risk.